Paula once again you have nailed it!!! I so love what you create. It just makes me want to grab my stamps and have a go!!! Well done Paula, you are an inspiration my friend. :-) Hopefully your sick computer won't be long till it is all better again. Will miss you!!! Perfect male card - will have to do these colours and stop thinking "blue" for a man!!! Thanks for sharing that, Paula - I love it. Don't be gone too long, y'hear? 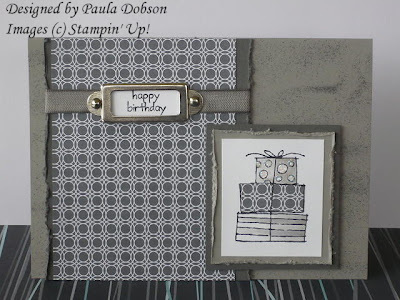 I love both cards you made for your husband, Paula - sure doesn't look like you struggle with male cards! They're great! CONGRATULATIONS on joining the Design Team over at Just Add Ink - very exciting news! You go, girl!! AND super duper for you to get picked for the DT on JAI - such a worthy person! congrats! Fantastic card Paula. I'll be waiting in anticipation for your return. Awesome card Paula. The grey on grey, hardware & bling work really well together.